Recently I was approached by Hair Flairs and asked to review a new product they had come out with. Hair Flairs Color Rub is a temporary color that literally rubs directly on to hair and creates a fun look until it washes out with the next shampoo. Of course Keyanna and I jumped at the opportunity to do this review, She was thrilled with the idea of having colorful hair.. 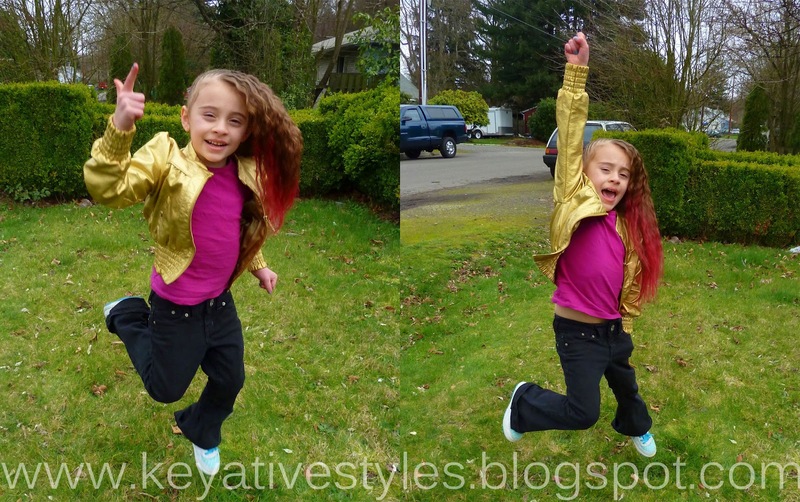 So we took a look at the site and she chose the Fuchsia Flare color. When we first received the Color Rub in the mail Keyanna couldn't wait to try it out, I was a little skeptical of how well it would really work since it is in a powder form and I had never seen anything like it. We immediately took down her ponytail she had been wearing that day and I applied the color rub to a strip of her hair. I was surprised how bright it was since Keyanna's hair is a darker blonde/brown, it really stood out. I didn't apply much because I wasn't sure how temporary it really was, but after her bath that night there was no evidence that she had ever had pink hair. 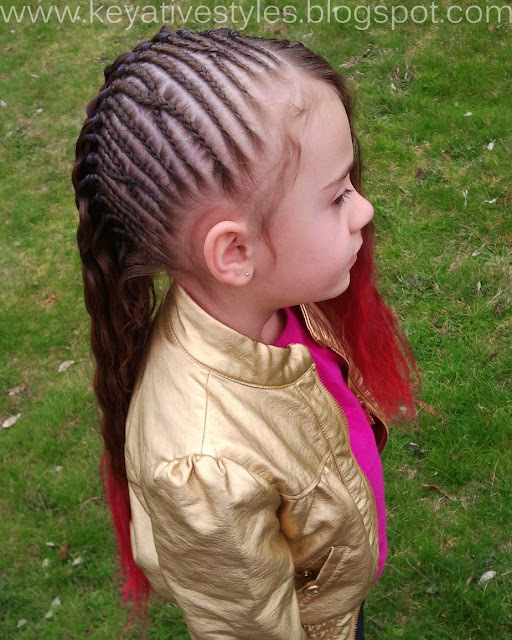 The next day I braided her hair and decided to add some pink to the tips of her hair for a rockstar look, and she definitely felt like one! 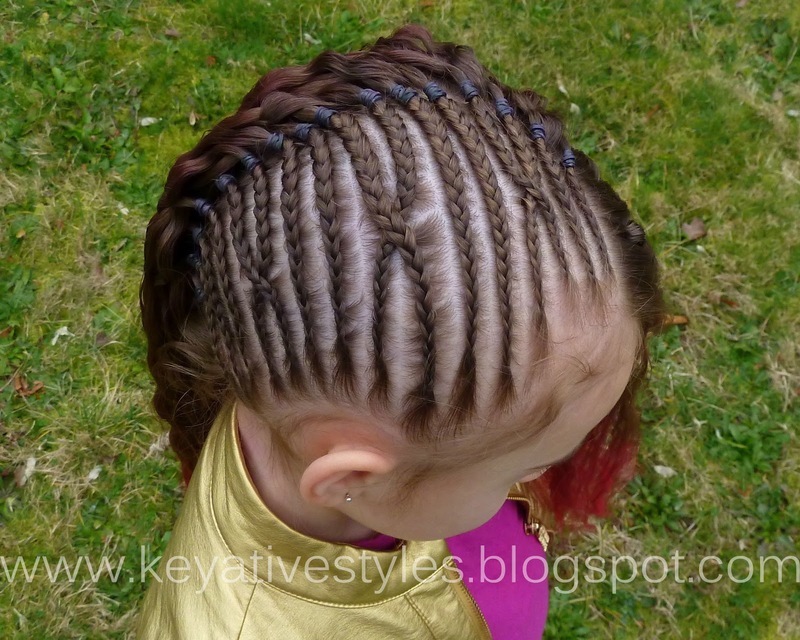 Before applying it to Keyanna's hair I watched their "How-To" video, The color rub was very easy to apply. I opted against using gloves and the color did stain my hands so I would recommend everyone take their suggestion and use them. They also mention that the color rub can transfer onto clothing and suggest wearing darker colors. Overall Keyanna and I are very pleased with this product. She received a ton of compliments over the weekend, and is asking for more colors now! I love that the color was so bright, but is very temporary and washed out easily. You can purchase Hair Flairs Color Rub on their website for $13.00, and they have 9 colors to choose from. We used about half of our color rub to create this style. 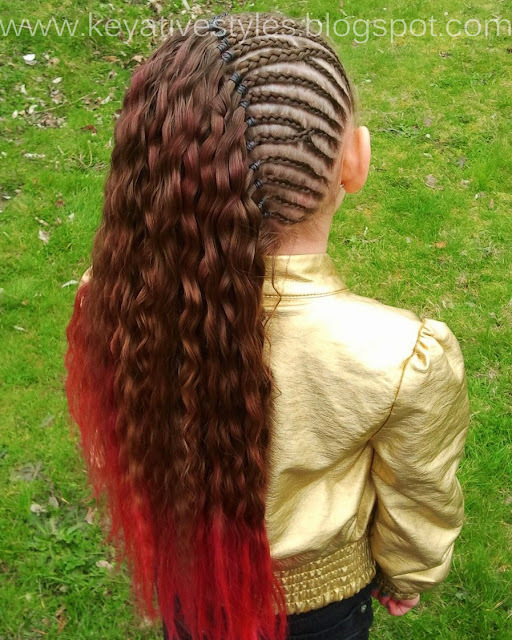 Don't forget to "Like" Hair Flairs on Facebook! Great review, love that pretty pink hair! Awww, she is the most beautiful little princess! I love her pink hair! She is such a pretty little rock star!! The color looks so pretty in her hair!! Love it the braids look amazing and this product is genius! Great Review! How cool is that!! I wonder how well it would show up on D's hair color. I love that style! So pretty! Yaya is over here Oooing and Ahhing! Lol... She has been wanting me to add some color to her hair lately. That would be great! I too wonder how it would show on her hair as well. I think it looks great. I too wonder how well it would show on darker hair. LOVE THIS!!! Her hair looks gorgeous, and I love the idea of it washing out w/the next wash!! BRILLIANT!!! That looks soooo fun! I sooo love that pink on her ends. Rock ON!! What was the condition of her hair afterwards. Were the ends dry at all from the color?